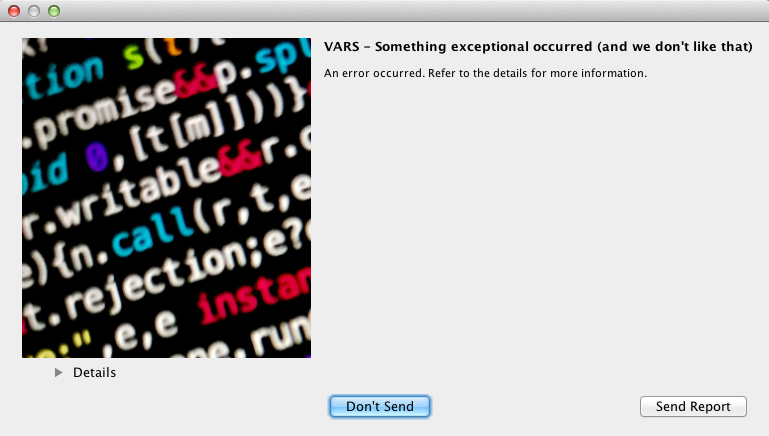 This guide gives basic instructions for starting and using the VARS knowledgebase interface. Useful definitions and descriptions can be found in the glossary. If you need extra help or information, see Contacts section here. 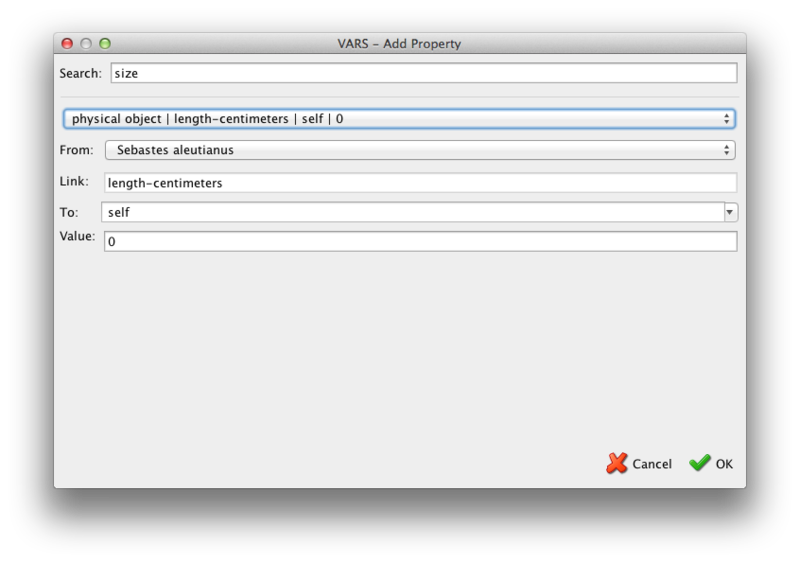 Start the program by double-clicking on the VARS knowledgebase icon. This logo will appear while the knowledgebase loads. After the knowledgebase finishes loading, the knowledgebase interface opens. To annotate in VARS and to enter and edit data in the VARS knowledgebase, you will need a VARS user account.If you already have a user account, you can simply log into the knowledgebase. Click on the padlock icon at top right of the screen. Select or type your user name in the login dialog and click OK. 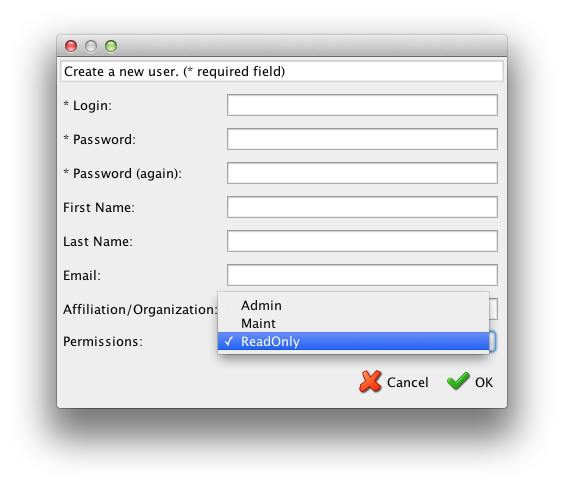 Create a new account with the appropriate permissions level for the knowledgebase. Click on the padlock icon at top right of the screen. In the dialog that appears, enter Login name, Password, First and Last Names, Email Affiliation, and Permissions level. 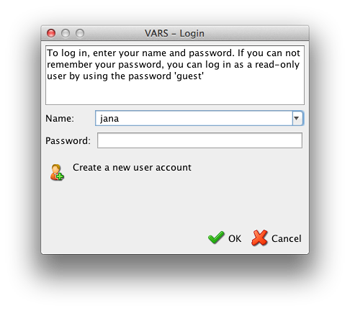 Click OK.
Do not use your network password as the VARS administrators can view the password you choose. 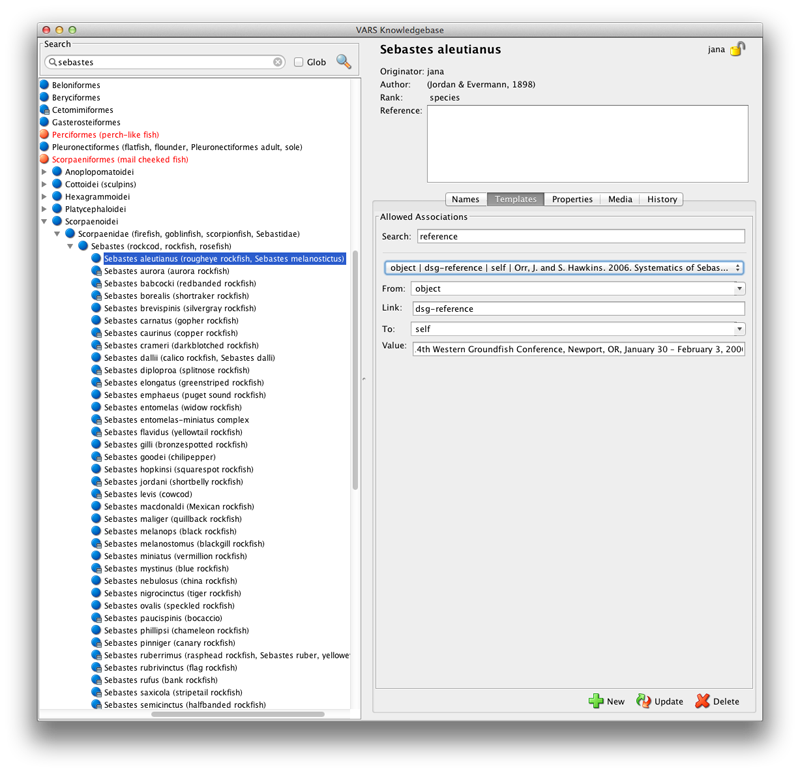 Type all or part of the search term in the box at the top left of the interface. Hit enter or the magnifier icon to scroll through the results in the browse panel.Knowledgebase data are arranged in hierarchical form. Each entry represents an object or a Concept. The root concept, or parent, is normally called simply, an “object”; from there, nested hierarchy suited for the particular field of study or data analysis needs (e.g. 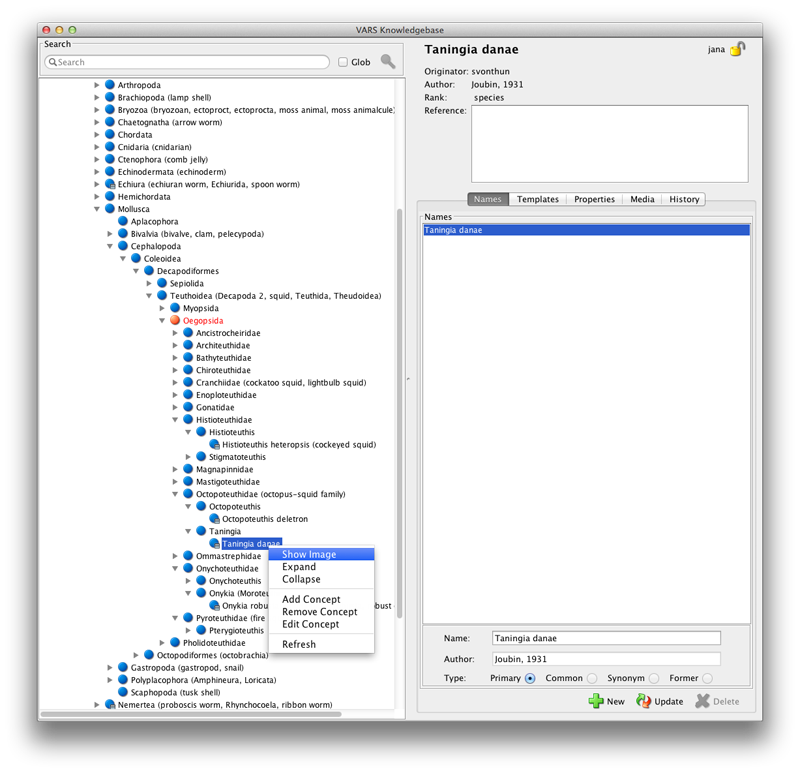 behaviors, regions, chemistry, geology, biology, other data types) can be created.Red font indicates that the concept name or its properties have been edited and require administrator approval.A small grey rectangle indicates that an image can be found associated with that concept. Select desired concept and right click to access the browsing and editing features. Alternately, use the triangle icons to Expand and Collapse the selected node. Add new concept name, or edit values including Parent, Author, ID Code, Rank Name, Rank Level, Reference. A concept name can also be selected for editing via the Edit Menu > Edit Selected Concepts. Refresh – Reloads the latest data from the database. Capitalization will be displayed throughout VARS as entered in the knowledgebase. e.g., the first letter of each proper taxonomic name (except species). Italics, bold, and other formatting options are not available in the knowledgebase. Primary concept names cannot be changed in this field; use Name tab to update names (below). 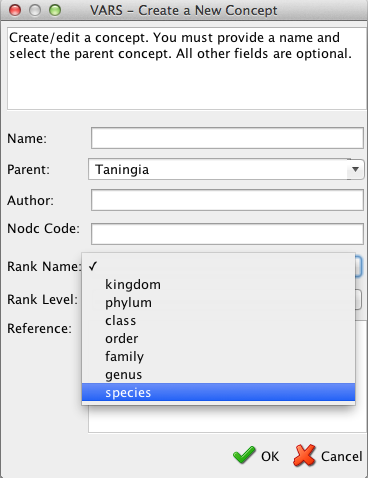 To move a concept to a different node in the hierarchy, choose the new Parent from the drop down list of existing names. 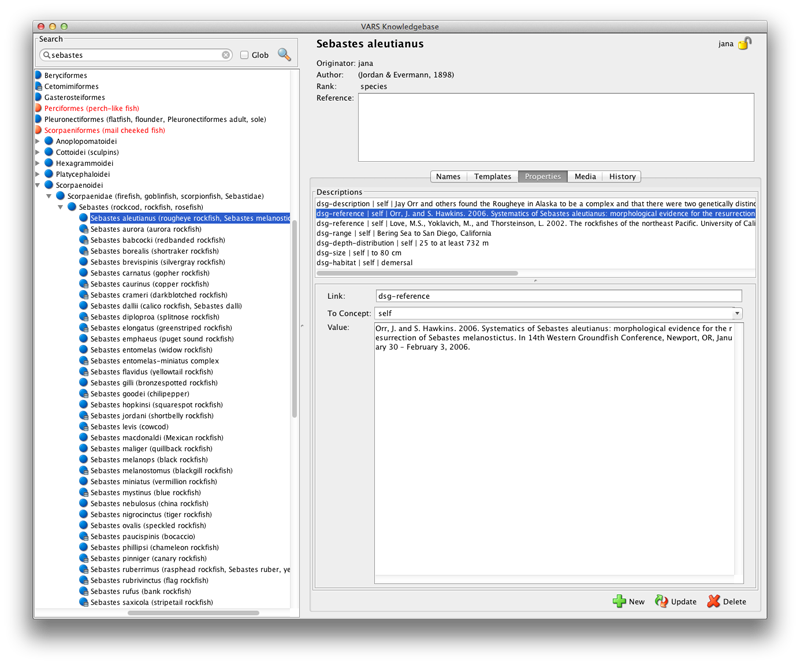 Dialog windows confirming the concept(s) being marked for deletion (e.g., may be more than one, if removing an entire node) provide additional level of protection against accidental deletion. Plan ahead when renaming a concept. If a concept name is going to be deleted entirely as opposed to a name update, any remaining annotations created with that concept will need to be appropriately renamed. 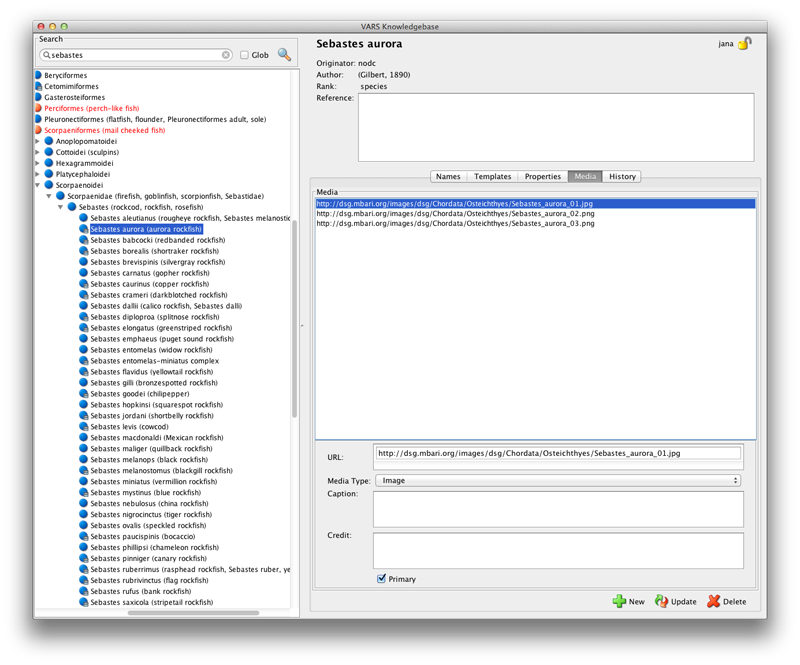 The best method for moving existing annotations to a new concept name is to a) change its Parent to the new name (thereby placing it under the name) and b) right click and select Delete. Note: this deletion must be approved by a user with administrator permission. See History below which explains the options for handling name deletions. For internal users, please view our MBARI conventions for Search and Browse here. Access the Names tab for the selected concept to add or edit the primary concept name and any alternate names. Primary concept name and author can be updated by changing the appropriate fields and clicking the Update button. Click New to add alternate names, types (e.g., common, synonym, former), and authors. If a concept’s identity is unknown, consider creating a “placeholder” name according to the MBARI VARS conventions. For example, Henricia sp. 1or lava formation A. It is not uncommon for a primary name to undergo a taxonomic name change. 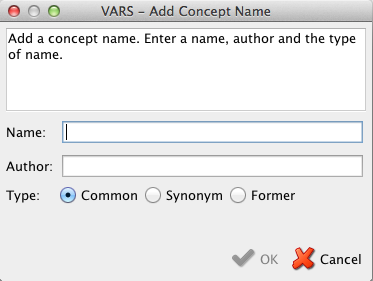 In the knowledgebase GUI, update the Concept to the new name using the Edit feature. For internal users, please view our MBARI conventions for Names here. Templates are a series of related fields that can be used to describe a Concept or object. They are created once in the knowledgebase and can then be used repeatedly to: a) attach as a “static” property (also known as an attribute or link realization) to any concept name in the Knowledgebase, and b), attach an “instance” property to any real observation made during the creation of annotations. Click New to open the dialog window for adding a new Template (Note: Search feature is disabled here as user expected to create a new, unique Template). To change an existing Template, select and edit the field and click Update. Care should be taken to not duplicate descriptors. If a property could be relevant to multiple, related concepts within a larger group, it should be added at a higher level in the hierarchy. If a property would only be applicable to a specific concept, it can be added at that specific level. The Link Value field character limit when making a new Template is 2048. For internal users, please view our MBARI conventions for Templates here. Properties are created from preexisting Templates. 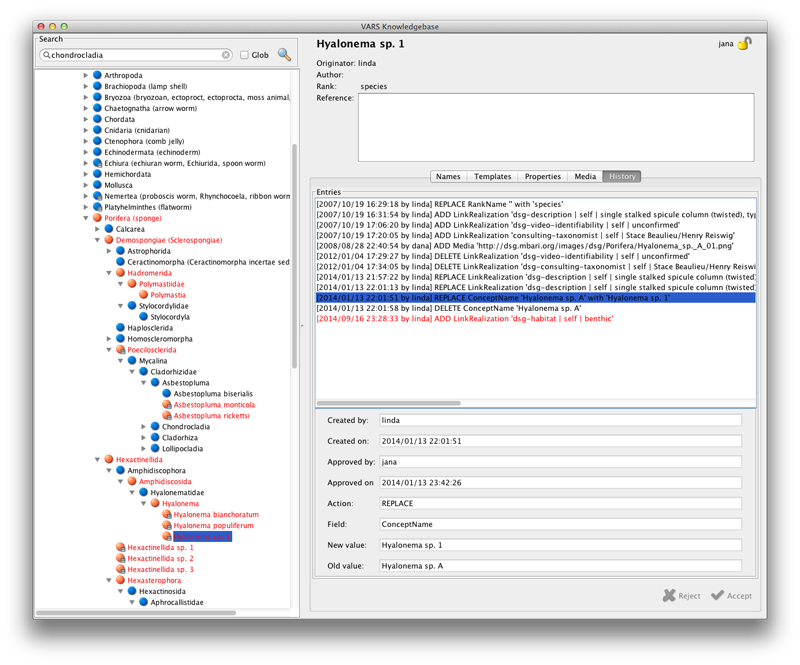 As described above, Properties are added as a) “static” properties attached to, and always known to be true for, a specific concept in the Knowledgebase or b) as “instance” properties to unique observations made during the annotation process. Click New to open the dialog window for adding a new Property. To change an existing Property, select and edit the field and click Update. Pre-populate the knowledgebase with common properties expected to be needed for describing the concepts and procedures for the particular area of study (e.g. 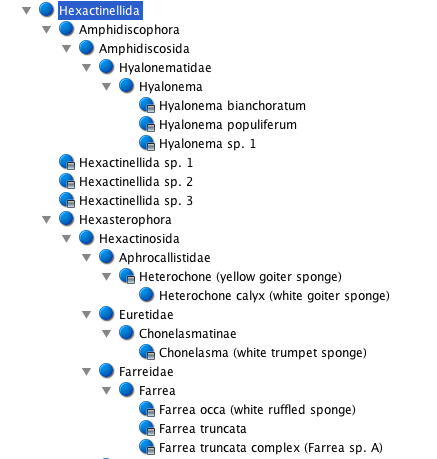 geology, chemistry, ecology, equipment, sample identity schemes, etc.). Avoid potential for misspellings and variable entries by limiting the number of properties that allow for free form Value entries. The Link Value field character limit when creating a new Property is 2048. For internal users, please view our MBARI conventions for Properties here. Any type of media file can be linked to individual concepts in the Knowledgebase. Typically they would be the best representative imagery, e.g., for identification or illustration of particular features. 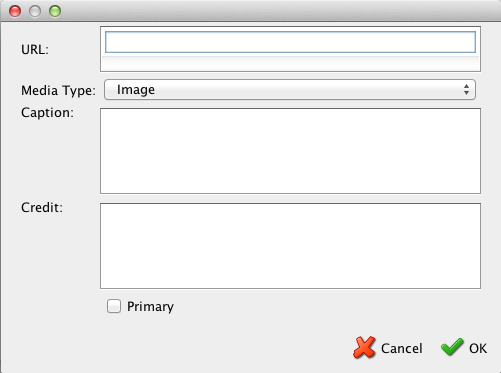 In the dialog window that appears, enter URL (location of image), Media Type (icon, image, video), Caption, Credit, and check box if it is the Primary image (e.g. best representative for identification). For internal users, please view our MBARI conventions for Media here. All Knowledgebase changes by all users are tracked in the History. As noted above, concepts with new edits appear red in the hierarchy until they are approved. For each entry, the following parameters are viewable by all users: Created by and on which date, Approved (Rejected) by and on which date, Action, Field, and New and Old values. Users with Administrator permission can approve additions, deletions, and edits to the Knowledgebase. To do so, select Reject or Accept each change using the buttons on the bottom right of the screen. 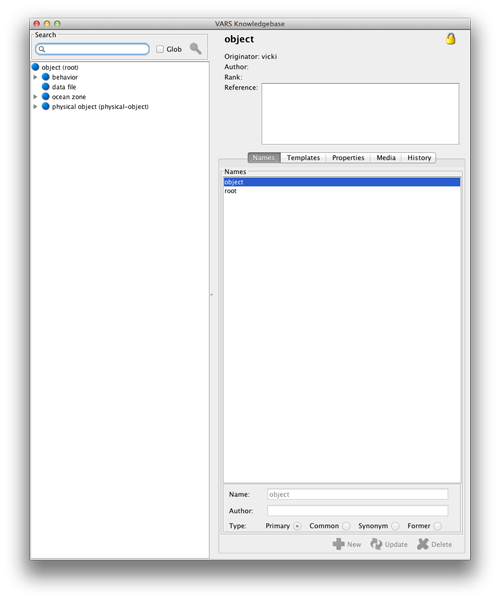 If a concept name(s) or properties are being deleted, additional dialog boxes will appear for the user to make a final confirmation.